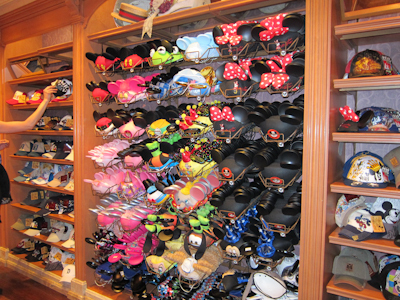 Once upon a time you could get a pair of mouse ears in black or pink. And it was a godawful 80s pink that looking like you just drowned your eyeballs in Pepto Bismol. So of course I had a pair. Nowadays, they have ears for everything. Not just Mickey and Minnie too–like, everyone. And where do you go to find this wide selection of ears? You can try the Mad Hatter! 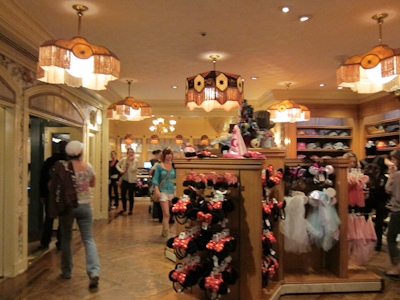 One on Main Street, one in Fantasyland by the Teacups. Now I could have sworn I have a picture of the outside of the Mad Hatter, but it looks like I do not. So if I find it later, I’ll throw it in–okay? But I prefer the classic black. I actually kind of own too many mouse ears. I have a black pair that say “Mommy” from my Halloween costume this past year, I have a black set that say “MYWTM” that I unfortunately mistakenly bought in the wrong size (child rather than adult) so they sit rather weirdly on my head, I have a gold set from the 50th anniversary in 2005, and I have a Captain Mickey set from the cruise that for some reason I couldn’t live without. Oh, and also a set from the Mouse-In-Law. Now what I’m living without is a place to put all of these. Short of sticking them on stuffed animals (which I’ve done), anyone have any ideas how to display them or something? They are currently sitting on top of our dresser and I think Kevin’s a little miffed about it. He did tell me to stop buying them. To be fair, he’s correct. Anyway, you can get your name written on your ears (and many other hats). And I have to say, this is one “improvement” I do not care for. Back in the old days, you got your ears/hat and you could get your name written on them for free. 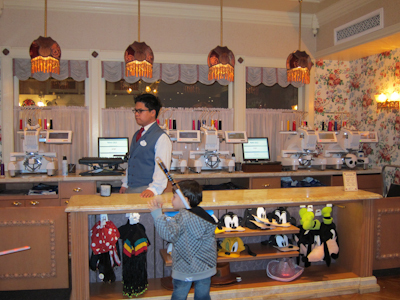 The sewing machine was worked by the cast member who had to turn the hat inside out, write your name backwards, on a machine that only went down and left. It was truly impressive to watch a hat writer shove these things around and come out with perfect names in the same script every time. Now it’s done by automated machine. The name is no longer free–a regular name in script is like $3 or you can get a premium name in two other fonts with whatever you want it to say, like “Happy Birthday Beauregard 2012” or “MYWTM” for a higher fee. The main problem, however, is that the new machines take for.ev.er. to write. And even if they have 2 or 3 machines going, you’re waiting for a year and a half to get yours done. If they could speed that up, I wouldn’t get so grumpy about it. Not that I’m really grumpy. I mean, after all, they are mouse ears, but still. Grump. My sister was a hat writer when she worked there. . . she loved it! When we had a Mickey Mouse birthday for the twins, she “wrote” on their names on the cake. It was pretty cool! My husband is a popcorn fanatic so we got the ones that have the popcorn box on top of them. Fun! My mom and I get a pair of ears every time we go, which is roughly 4 or 5 times per year. We generally buy the “headband ears” (as opposed to the “hat ears”). We keep them in a vase on top of a bookcase, putting one side of the headband in the vase, and letting the other side of the headband hang out. It’s like a bouquet of mouse ears! As for the actual hats… we haven’t quite figured out such a great display method. I only have one pair of ears now – I bought a Haunted Mansion set when we were there last year. I love them so, so much. I guess they were pretty new at the time, because cast members kept telling me they’d never seen them. Ha!